Owls are generally nocturnal animals, meaning they are active at night. At night, Verreaux’s eagle owls hunt a wide variety of animals including hedgehogs, reptiles, fish, amphibians, rodents, and other birds (including other eagle owls). This species can see incredibly well from its perch. When it spots prey, it silently swoops over it and scoops it up with its talons. They are so good at hunting, they will wade into water to catch fish or grab small birds in mid-air. Eagle owls lay two eggs in a clutch. The female incubates one for 38 days but usually eats the other after two weeks. After the one egg hatches, the chick stays in the nest for nine weeks. It stays dependent on its parents for the first six month of life and can stay with the parents until maturity. Females Verreaux’s eagle owls have rounder faces and are heavier and larger than males. Juveniles can be identified by white patches on their heads. They also appear to have “soot” on their bodies. 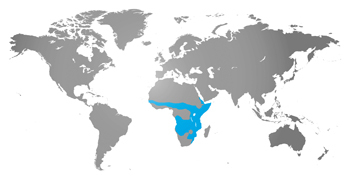 Even though it is common in its extensive African range, many countries have created protected regions for this bird. The species’s low reproduction rate has led many governments to monitor the population carefully. Verreaux’s eagle owl is least concern. See what else the Zoo is doing in our ongoing commitment to conservation. You can help save the world’s wild animals and wild places. No effort is too small!